From the best business radio show out there, the Business of Success brings you the best interviews from top business leaders and celebrities as they share the pitfalls and rewards of running a business and achieving success. So whether it's podcasts on Leadership, Market Trends, Investment or Marketng advice you're looking for, then take this opportunity to listen the very best business talk resource around! The radio show that's broadcast coast-to-coast across the USA to over 1.5 million listeners and globally via live internet streaming. Tune in every Sunday from 12 noon to 2.00 p.m. (EST) for the best in business talk radio. For a little book, it's big on investment advice! Self-made Billionaire Speaks Out on Honesty & Generosity, hear his interview with Alan Rothman by clicking on the BOS Billionaires Club category on our blog! One of the most popular and content rich trading blogs out there! This is an excellent site. It's packed full of practical trading advice. It's a unique site where you can read and submit articles on being a successful market trader, speculator, and investor. Check it out! 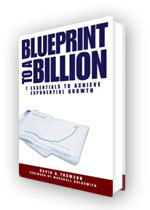 Our fascination with companies that turn billion dollar ideas into billion dollar businesses is aptly sated in this next interview as we talk to the charming David G. Thomson, author of the book, Blueprint To A Billion: 7 Essential Steps to Achieve Exponential Growth. Click the above link and hear Thomson's give a fascinating account of what it takes for companies to hit the critical billion dollar benchmark, as he gives a down-to- earth account of the 7 essential principles required to get you there. Think Google, eBay, Microsoft, Starbucks, Nike and Harley Davidson.... these are just a few examples of an elite group of companies that have managed to turn billion dollar ideas into billion dollar companies. Thomson has written a terrific book that is the product of a 3-year in depth research and analysis of the commonalities between all of these billion dollar companies. Hear the common characteristics that have proven to be the magic formula, and where the next billion dollar companies are likely emerge from. If you have a big picture vision for your company, then this is the interview for you!